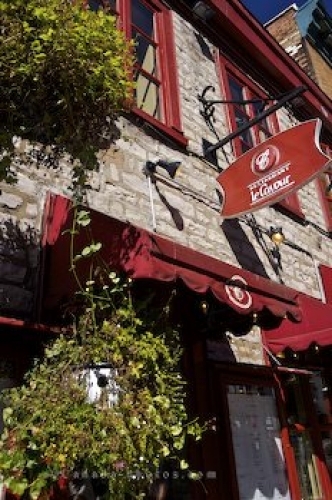 In a historic stone building in the Joseph Bouchette House along Rue Saint-Louis in Old Quebec City, Canada you will find Le Cavour Restaurant. Red awnings and red painted wooden frames decorate the exterior of the restaurant as spring flower baskets begin to flourish. Picture of the facade of the Le Cavour Restaurant along Rue Saint-Louis in Old Quebec, Canada.